Will NH Privatize Youth Corrections? Another version of this was published in the Concord Monitor. We’ve been around this block before. That line, buried in what became Chaptered Law 0224 when it passed on June 22, 2011 and became law without the signature of Governor John Lynch eight days later, set in motion a costly two-year investigation into the possibility of outsourcing the state’s prisons to a for-profit firm. First, staff at the Departments of Corrections and Administrative Services spent five months preparing three lengthy “Requests for Proposals” to solicit interest from private firms. The responses from four companies, which arrived between late January and early March. There was so much paper in the bid documents — said to be so bulky they filled a room at the State House Annex – that the State needed an outside consultant. It took four more months, and an appropriation of $177,000, for the state to hire MGT of America to analyze the proposals. It took nine months for MGT to compete its report. “The state should be concerned that this significantly lower wage may make it difficult to maintain a trained and experience staff,” MGT said. “This could result in high turnover and ultimately impact and safety and security of the correctional facilities.” In other words, the way to make a correctional facility profitable is to lower the wages and benefits paid to workers. That dooms the facilities to dependence on workers who hope to leave and find a better job, not the kind of people we want to manage adult or juvenile corrections. Based on the consultant’s report, the State “determined that it was in the best interest of the State to cancel the solicitation process,” according to a report released in April 2013, nearly two years after the process started. “The decision to cancel, after having invested so much time and consideration, was not made lightly,” the Departments of Corrections and Administration said. With that in mind, we should not go lightly into a new privatization process, this time for youth corrections. Evidence from around the country has shown that for-profit companies are ill equipped to handle the responsibility of incarceration, whether the prisoners are juveniles or adults. Their facilities tend to be under-staffed, less secure, and don’t even save money for taxpayers. Last summer Florida cancelled a contract with another for-profit operator of youth detention facilities, Youth Services International, after evidence of excessive or unnecessary use of force. The company is barred for a year from bidding on new contracts, but it still runs nine other Florida facilities. We’ve been around this block before. Let’s not go there again. Arnie Alpert is New Hampshire Co-Director for the American Friends Service Committee, a Quaker organization devoted to social justice and peace. 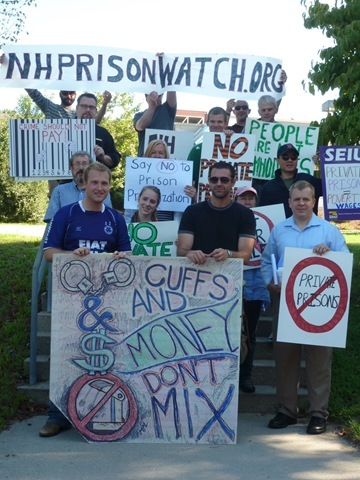 New Hampshire will not privatize its prisons, at least not in the near future. That’s the decision announced by the state today with the release of a long-awaited analysis of bids submitted by four private firms in response to a 2011 Request for Proposals from the state. “More specifically, the proposals exhibited a lack of understanding of the overarching legal requirements placed upon the DOC relating to the court orders, consent decrees and settlements which, in large part, dictate the administration and operation of their correctional facilities and attendant services to the inmate populations,” the state agencies said. That the private industry leaders were not able to explain how they would actually meet the state’s legal obligations should be seen as evidence that these companies can’t be trusted to operate prisons anywhere. “The state should be concerned that this significantly lower wage may make it difficult to maintain a trained and experienced staff. This could result in high turnover and ultimately impact the safety and security of the correctional facilities,” MGT added. The state’s report leaves open the possibility that the state would entertain privatization as an option at some point in the future. That would be a huge mistake. Instead, the legislature should pass HB 443, a bill that blocks the state from considering privatization. This measure has already passed the NH House and comes before the Senate Finance Committee next Tuesday. Maggie Hassan made it pretty clear during her successful campaign for governor that she has no interest in turning over control of New Hampshire’s prisons to for-profit corporations. The majority of Executive Councilors elected in November feel the same. While the State is still formally reviewing proposals from four private companies to build and operate its prisons, the chance that a contract for prison operation would be drawn up in the next two years is about as close to zero as it can get. So why have at least two of the companies (CCA and MTC) bothered to invest in lobbying services to defeat HB 443, a bill which would ban private prisons in New Hampshire? For insight into this and other questions, the companies’ Form 10-Ks, filed annually with the Securities and Exchange Commission (SEC), are worth a read. Efforts to ban private prisons, even in states that don’t have them and aren’t about to get them, are a risk to the business model of private prison companies. “The movement toward privatization of such facilities has encountered resistance from groups, such as labor unions, that believe that correctional, detention, mental health and residential facilities should only be operated by governmental agencies… Increased public resistance to the privatization of correctional, detention, mental health and residential facilities in any of the markets in which we operate, as a result of these or other factors, could have a material adverse effect on our business, financial condition and results of operations,” GEO adds. CNN also reports, “Sen. John McCain has changed his views on immigration over the years. For instance, the Arizona Republican first supported and later opposed a path to citizenship for illegal immigrants. He is also the fourth-highest recipient of campaign donations from Corrections Corporation of America.” Maybe it’s just a coincidence. Maybe not. If corporate persons can be said to have a corporate conscience and a corporate mind, we can say that private prison companies are morally flawed. But we shouldn’t discredit their brains. They know how their bread is buttered, and they are acutely aware that we can cut off the butter by changing immigration laws, reducing sentences, and de-criminalizing offenses like possession of marijuana. We can take away the whole loaf by banning private prisons, as HB 443 proposes to do in New Hampshire. HB 443 states that incarceration is an “inherently governmental” function and cannot be outsourced to for-profit companies like CCA, GEO, and the Management & Training Corporation (MTC). An amendment approved by the House Criminal Justice and Public Safety Committee would allow the Commissioner of Corrections to transfer prisoners to privately operated prisons on a temporary basis in the event of an emergency, such as a fire. With that amendment and a bi-partisan 13 to 5 “ought to pass as amended” recommendation from the committee, the bill is heading for a vote by the full House this week. Illinois and New York already have similar laws on their books. Since passage of HB 443 would have an “adverse effect” on their business model, we can expect the private prison companies to step up lobbying efforts in the Senate if the measure clears the House. GEO makes another interesting point in its 10-K (page 31 if you want to look it up): “State budgetary constraints may have a material adverse impact on us,” they say. This is a curious observation given the fact that the private prison companies insist they save money for taxpayers. Yet, GEO says, “budgetary constraints in states that are not our current customers could prevent those states from outsourcing correctional, detention or community based service opportunities that we otherwise could have pursued.” In other words, GEO appears to acknowledge that private prisons aren’t less expensive after all. There’s plenty of other data in these reports. There are lists of their prison facilities. CCA reports that only 785 of its 17,000 employees are unionized, while GEO says 21% of its workforce is covered by collective bargaining agreements. Both companies see union organizing as a risk. Both companies provide extensive details about their creation of Real Estate Investment Trusts. Enjoy your reading, with awareness that if you are working for immigration reform, reduced incarceration, and the shut-down of the private prison industry, someone in GEO’s and CCA’s corporate offices sees you as an element of their risk profile. If anyone has the Form 10-K for the Management & Training Corporation, please pass it along. 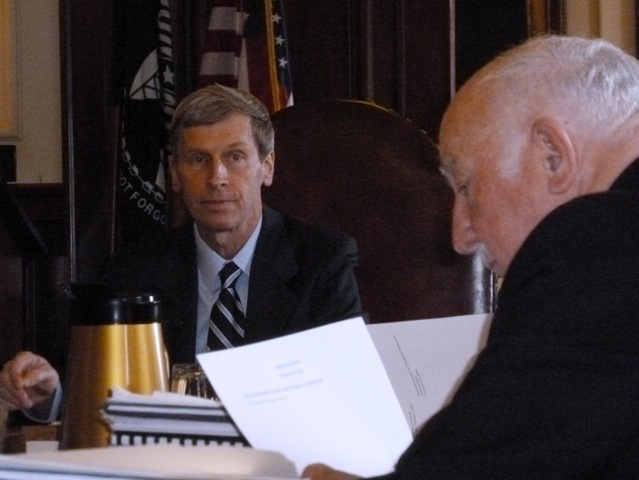 New Hampshire’s Executive Council voted today to extend the contract of a private consultant that has been evaluating proposals from four firms interested in for-profit operation of the state’s prison system. The consultant, MGT of America, now has until February 28, 2013, to complete its work. The original contract, approved by the Council in July, called for the firm to turn in its report by October 5 and to be available until the end of that month to explain its findings. When that date arrived, the company was given an extra ten days. When October 15 arrived, the Department of Administrative Services said completion of the report would be delayed until mid-November. When mid-November arrived, Administrative Services said the report would be done in mid-December. MGT will not get additional payment beyond the $171,000 of the original contract. The main impact of delay is that MGT, Administrative Services, and the Department of Corrections will be reporting at the end of February to a new Governor and a changed Executive Council. The state received the four bids last spring after issuing a relatively vague request for proposal last spring to build and perhaps run a prison to handle all of the state’s inmates. Thus far, no other state has turned its entire prison population over to a private company. That RFP was the result of even vaguer legislation – never debated by lawmakers but instead tucked into a large budget bill — that appeared to be more interested in looking at shipping inmates out of state to private facilities elsewhere. However, the wording morphed into an RFP for a private prison company to set up a facility so large that it would have the capacity to import prisoners in from other states, an idea favored by outgoing Gov. John Lynch. 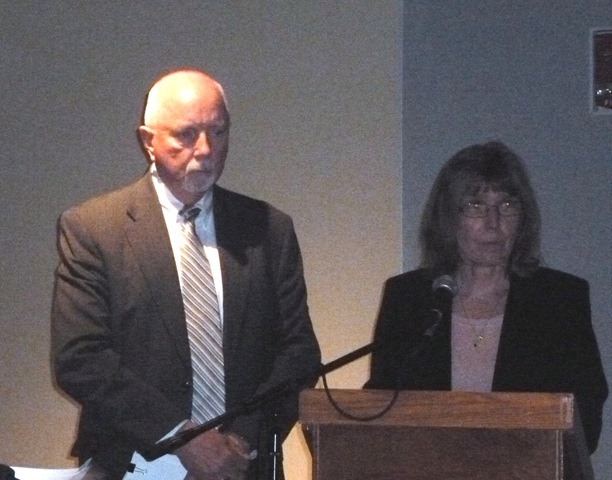 Asked by outgoing Councilor Dan St. Hilaire if it is still worth it to finish this project, Commissioner Linda Hodgdon of Administrative Services told the Governor and Council the report would put a “whole comprehensive report in front of you” for consideration as they look into whether and how to replace the women’s prison in Goffstown and the men’s prison in Concord. When retiring Councilor Ray Wieczorek said the information would help the new Governor and Council decide whether to pursue privatization, Governor Lynch said there are many forms of privatization. “We need a new women’s prison and at some point we’re going to need a new prison in Concord,” he said. Lynch has been promoting an approach in which the state would contract with a private firm to finance, build, and own a major prison that would then be leased to the state. The ostensible advantage is that the state would not have to worry about financing a major construction project. The political advantage would be that the expensive enterprise would be handled as a contract by the Governor and Council, thereby evading the Legislature’s always thrifty capital budget process. But once the contract is signed, the Legislature would have little choice but to include payments in the biennial state budget. Such an approach would also give a for-profit prison company a position from which it could make the case for full-scale privatization. Each of the four firms responded to a complex Request for Proposals that asked for details on plans to build and operate a men’s prison and a prison that would house both men and women. Each proposal presumably also includes the build/lease option for both types of facilities. That means there are 16 proposals to analyze, not four, and that they all need to be compared to status quo arrangements and to construction and operation of new facilities fully in the hands of the state. Privatization opponents hope to talk soon with newly elected Councilors. Today was also Organization Day for the newly elected Legislature. The House bears little resemblance to the pro-privatization gang that ran the joint for the previous two years. Legislation to prohibit privatization may meet a warm reception. 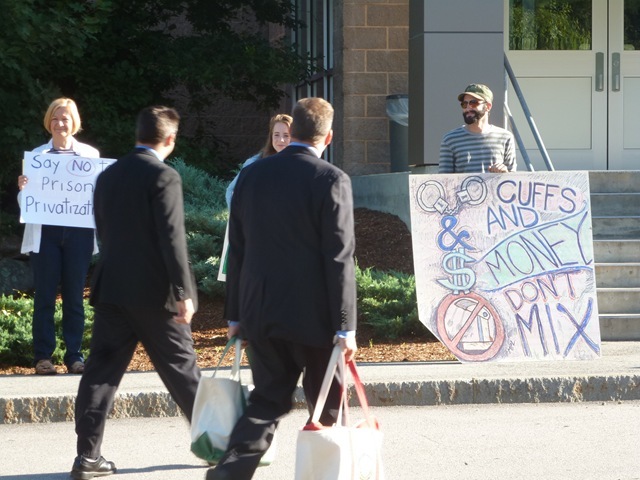 New Hampshire’s five Executive Councilors were greeted this morning by twenty activists holding signs opposing privatization of the state’s prison system. The issue was not on the Council’s formal agenda for its meeting at the Manchester School of Technology, but it is clearly on the minds of a growing number of concerned citizens. The State is in the process of evaluating bids from four private firms interested in a contract to operate the state’s prisons. At its previous meeting, July 11, the Council appro ved a $171,000 consulting contract with MGT of America to help state employees evaluate the proposals. 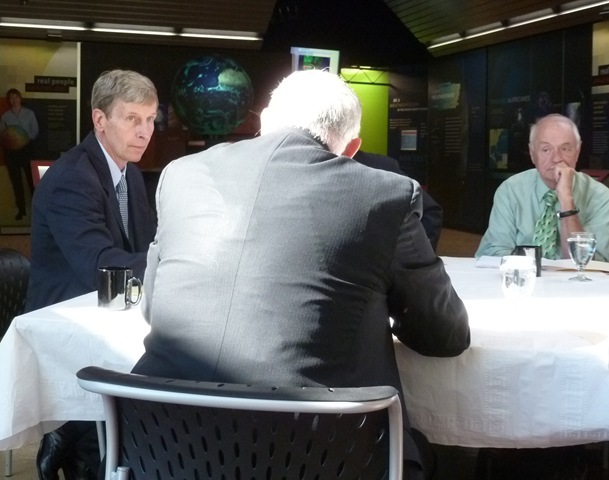 The governor insists the state is merely gathering information to inform decisions which would be made following discussions of public policy implications. But no plan has yet been revealed for public discussion of the bids or the MGT analysis. 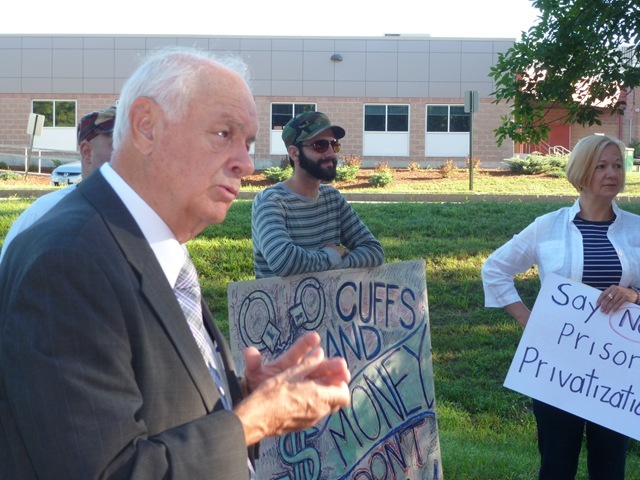 Outside the School of Technology, Councilor Ray Burton had a friendly chat with a handful of anti-privatization activists. He pointed out that decisions are likely to occur after the November election when there will be a different governor and a changed make-up of the Executive Council. New Hampshire’s Executive Council voted 5 to 0 this morning to approve a contract with MGT of America to review 8 proposals from 4 private firms interested in building and operating prisons in the Granite State. In a meeting characterized by debate-less votes on contracts and appointments, this one at least merited comments from most of the Councilors and responses from Department of Corrections and Department of Administrative Services leaders. Linda Hodgdon, who heads the Department of Administrative Services, said state workers did not have time to analyze the 60 boxes of documents from the 4 bidders. The MGT analysis, which is supposed to be completed by October 5, will enable an “apples to apples comparison” between the proposals, and also with continued state operation of the prisons. She said she has received an email from MGT assuring her that their analysis will be objective. 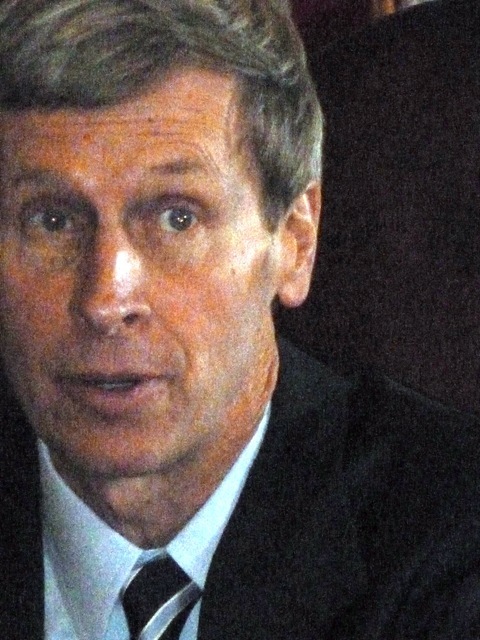 Hodgdon said there is “no pre-conceived outcome” of the process. “The State could decide not to do anything,” she said. “We may decide it’s not worth our while to go with any of the 8 proposals,” added William Wrenn, Commissioner of Corrections. Governor John Lynch also stressed that build-lease, in which a private firm would finance and build a new prison then lease it to the State, is also an option. Both Wrenn and Hodgdon insisted the data from MGT will inform a discussion of whether privatization is a good idea. Exactly how and when this policy discussion will take place is as yet unclear. What is clear is that the MGT report will be released just as the election campaign is heating up. Since John Lynch and two of the five Executive Councilors are not seeking re-election, a process that allows a decent amount of time for public discussion could extend beyond their terms of office. Get more information at www.nhprisonwatch.org. New Hampshire’s Executive Council will vote July 11 on a $171,347 contract with MGT of America to analyze proposals from four companies interested in taking over the state’s prisons and running them for profit. So far the fact that private prison companies have extensive records of scandalous performance has not halted the process. The record from other states provides ample evidence that instead of producing savings or improved services, privatization leads to decreased public safety, worse conditions for prisoners, worse working conditions for prison employees, and no savings for taxpayers. If the Executive Councilors are doing their homework, they will say “no” now to privatization, reject the consultant contract, and save the state a pile of money. That’s not likely. But the tawdry record of the privateers could be revealed if MGT does its job. The contract explicitly calls on the consultant to “identify performance and financial risks associated with privatization options” and to “compare the costs and benefits of government management of the detention system with potential privatization of the facility.” We won’t know, though, until their report is completed in early October. In a recent opinion column published in the Concord Monitor, Nashua Telegraph, and Keene Sentinel, I wrote that “the public deserves a full and open airing of the privatization issue,” which has thus far been evaluated mostly beyond eyes and ears of the public. Privatization opponents (I’m one of them) have just launched a new web-site to make information and action needs easy to find. “During the process of evaluating these varied proposals,” the document continues, “it was determined that it would be beneficial to hire a consulting firm to assist in the evaluation, particularly in relation to the operational/financial analysis of the proposals.” MGT of America appears to have been the sole bidder for the job. The privatization inquiry was initiated by the Legislature, which ordered the DOC to consider privatizing the state’s prisons. Four firms – Corrections Corporation of America, the GEO Group, Management and Training Corporation, and the Hunt Justice Group, which has recently merged with the CGL Corporation – submitted bids. Unlike most contract proposals, in which the state proposes to purchase a specific product or service, the prison RFP gave vendors a wide variety of options. And since the DOC was ordered only to investigate privatization, it is also an option for all four proposals to be rejected. The job of the consultant, assuming the contract is approved, is to develop a way for the state to compare proposals from the four companies, and also compare them with the non-privatization option. MGT’s work would start July 11 and extend through the end of October, according to the contract. Its report – which could recommend a contract with one of the 4 vendors or reject the privatization option — would be submitted by October 5. New Hampshire’s Executive Council is a relatively obscure but extremely powerful part of the state government. In a sense a leftover from the early post-colonial period when American revolutionaries were intensely suspicious of executive power, the five members of the Council have to ratify most gubernatorial appointments and all contracts above $10,000. The Council would also vote on a privatization contract if one emerges from the MGT study. Based on the timing, details of a privatization deal could become public just as the election campaign is heating up.